The leaves are turning brown…there’s a nip in the air…the nights are drawing in. Winter is on its way! Although we at Aura Chai prefer warmer climates, there’s something undoubtedly romantic about snuggling down and cosying up with your faves in front of the fire. One thing we just CAN’T go without during winter are cookies and cakes…and this one’s sure to kick off Autumn nicely. These chai blondies are crispy on the top and gooey on the inside. And the recipe is vegan, gluten free AND refined sugar free – what more could you want? 5/ Bake for 20-25 mins until golden brown on top. 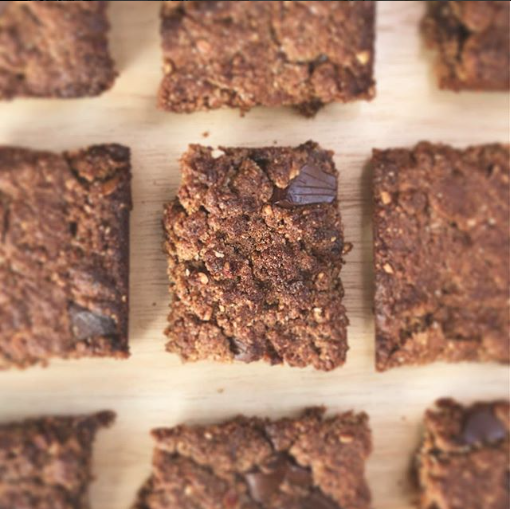 Leave to cool before cutting your freshly-baked chai blondies into squares.